The Arctic Chill Towel keeps you cool while you do the things you love. Whether you�re golfing, running, biking, playing tennis, weight lifting, or dancing, this cooling towel is perfect for having fun under the summer sun without having to worry about overheating. Best of all, the towel stays cool for hours so you don�t have to worry about it heating up while you�re busy enjoying your day. The Arctic Chill Towel is a perfect cooling towel for sports because no refrigeration is necessary. All you need to do is wet the towel, wring any excess water out and then shake the towel. Once you shake out the excess water you�re ready to stay chilled doing any activity. 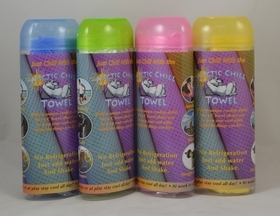 Arctic Chill Towels are available in blue, green, pink, and yellow, so you can color match your cooling towel for sports you play. For the most affordable, easy-to-use cooling towel, browse our Arctic Chill Towel selection and pick the color that�s right for you.